Recently the reporter for a very real real estate magazine asked me about the current state of architecture, land sales, and housing development in Second Life. And though I'd just written about social conflicts around land sales, going through my old entries, I realized it'd been a long time since I wrote about those three subjects in any kind of thorough way. Part of it has to do with the state of land and development being in flux, due to profound policy changes that will likely affect them. Even more-- as it always has been-- it stems from my vain attempt to give every part of the world its due, whether it's as business writer, game journalist, international relations reporter, arts commentator, or war correspondent, every story incurring an enormous opportunity cost of everything I didn't cover, instead. Then there's the strong impression (and I've had it since I started reporting here) that with homes in SL, there is, as Gertrude Stein once said of Oakland, no there there. "Overall," I told the reporter, "I'd have to say most Residents don't use their homes as 'homes', in the sense that it's not where they sleep or spend their free time (since being in SL is their free time)... Many use them to socialize with friends, of course, though for the most part, I think they treat them as dollhouses, places to fill out with furniture and art... or for builders, places to create their own idea of a perfect home. I'm amazed at how many houses are almost always empty-- like the point is not to live in them, so much as it is to have their personal identity permanently represented in a 3D space. 'This is the stuff I like and what's important to me,' in other words-- real estate and home ownership as a kind of 3D personal homepage or blog." But rather than make any more broad observations based on my daily fly-overs, last week I took a long in-depth tour of the world, with a singular focus on trends in architectural and land development. Luckily I was able to bring along an expert who's far more qualified to speak than me: Chip Poutine, in real life a recent graduate from a Canadian architectural college, now studying for his license to practice professionally. 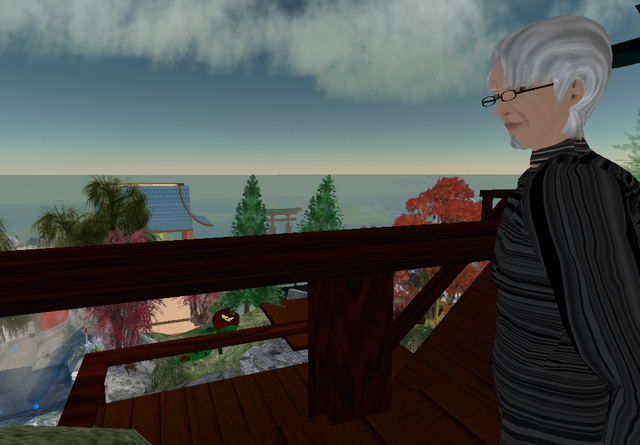 Chip's the author of "Virtual Suburbia", a profilic and eloquent blog exclusively devoted to reviewing the architecture of Second Life. "Writing about music," Elvis Costello once argued, "is like dancing about architecture-- it's a really stupid thing to want to do." So in that spirit, over the next few days, I'll document the attempt by Mr. Poutine and myself to do something triply foolish: blogging about virtual architecture. Didn't Frank Zappa say that "Writing about music" quote too? I've seen it attributed to several artists. O well, it's true. Actually, I believe the quote is from Laurie Anderson's United States I-IV. Could be, but when I was trying to recall its provenance, I Googled "who said 'dancing about architecture'", and out popped this. The whole site makes an interesting read, because even with this citation it's still in dispute. But who would I rather attribute it to, Costello or Martin Mull (!)? The origins of this quote have long been shrouded in mystery and controversy. When I first did a thorough Web search for an answer, wa-a-ay back on December 30, 1996, most instances didn't have any attribution at all - and those that did credited one or more of a dozen different people. "Writing about music is like dancing about architecture - it's a really stupid thing to want to do." --Elvis Costello, in an interview by Timothy White entitled "A Man out of Time Beats the Clock." Musician magazine No. 60 (October 1983), p. 52.